Captain Valmir is an Altmer who claims to be an officer of either the Stormcloaks or the Imperial Legion depending on which faction you have joined. He is found at the campsite in the courtyard of the ruined fortress of Forelhost. He asks for your help when you encounter him; speaking with him begins the quest. When disguised as an Imperial officer, Valmir wears a full set of Imperial light armor and wields an Imperial sword. 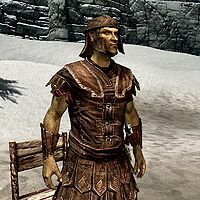 When disguised as a Stormcloak officer, he wears a full set of Stormcloak officer armor and wields a leveled war axe which may be up to steel in quality. In both cases, he also carries a torch, a potion of minor healing, and the key to the entrance of Forelhost. Captain Valmir knows the Destruction spell Flames, and the Restoration spell Fast Healing. You can pickpocket Valmir's Orders from him, which reveal that he was actually an agent sent to retrieve a mask and return it to Labyrinthian. Killing him counts as a murder at that stage. 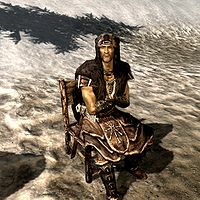 If neither faction has been joined in the civil war questline, Valmir will appear as a Stormcloak or an Imperial officer respectively, depending on whether you chose to follow Ralof or Hadvar during the quest Unbound.